I got a kick out of this one and I don’t mean kicked by a donkey. This soap was so milky, creamy and silky in sensation that I couldn’t help myself, I just kept thinking about Cleopatra in the shower. She herself bathed in donkey milk. What a spoiled brat she was, although, I can see why she did. Fully Organic (BIO) and Junk Free, this soap did not disappoint one bit. The lather was super rich and plainly luscious and I used it for shaving with great results. 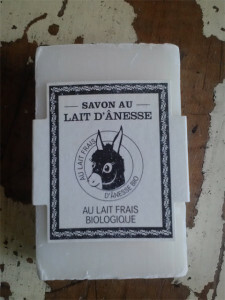 This soap leaves your skin feeling so nourished that you will want to rekindle your feelings for the Jackass (donkey). Really a great soap. You can find Savon de Marseille in the U.S. but I can’t yet confirm that you can actually get this particular one. That doesn’t matter though, there are plenty of All Natural Soap Makers in the U.S.A. that make amazing organic donkey milk soap. You should have no problem finding something good online. Go get some, I promise you will throw away that Dove Bar .